price point during the day although it did manage to recover marginally during the latter part of the silver trading session. 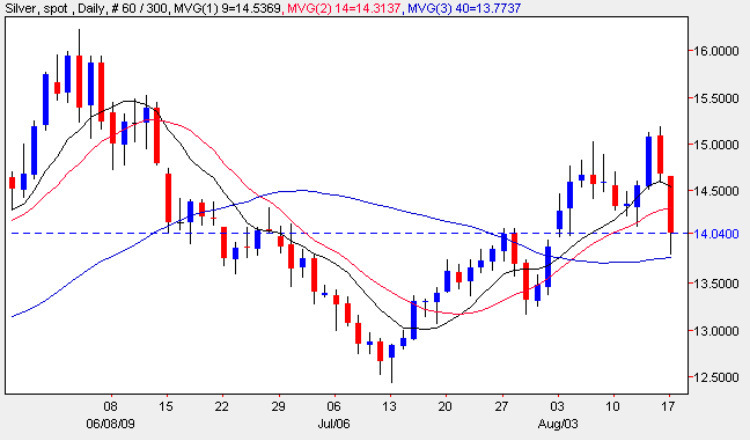 The candle closed with a small lower shadow which seemed to find some support from the 40 day moving average, an encouraging signal for silver trading bulls, and as a result we may see a small bounce in silver prices tomorrow as bargain hunters enter the silver market to buy on the recent two day reversal. It is interesting to note that spot silver prices also found support from the consolidation in the $14 per ounce region adding to the view that there may be some buying opportunities in tomorrow’s silver trading session. However, in the medium term it appears that the fundamentals in the wider market are now driving silver prices as global equity markets continue to fall as traders and investors become risk averse once again resulting in a strengthening of the US Dollar. Given the bearish picture on the gold chart it seems likely that silver too will follow suit in due course and therefore in the medium term it appears as though we may experience a possible reversal even as low as a re-test of the $12.75 per ounce level, but only if we see a break and hold below the 40 day moving average coupled with a crossing of the 9 and 14 day moving averages with a breach of the $14.00 per ounce support level. Short term bearish, medium term sideways, long term bullish.